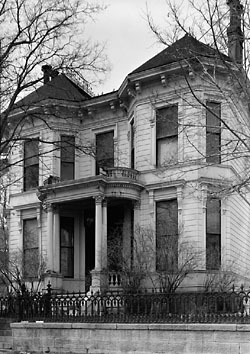 The King--McBride mansion is an excellent example of High Italianate architecture, replete with bay windows and a widow's walk. The King--McBride mansion was built about 1870 by George Anson King, a banker who established the Nevada Bank of San Francisco in Virginia City, and served as director of the Virginia and Truckee Railroad. It is believed to have been designed by architect Charles H. Jones, who designed a nearly identical house, the Rinckel Mansion, in Carson City. The three-story wood-framed building incorporates two bays flanking the central portico and an irregular floorplan, elaborate walnut staircase, marble fireplaces and 19th-century clear glass skylight. Several famous and wealthy Comstock residents owned homes near George King's mansion, including Bonanza king John Mackay, banker J. P. Martin, Judge Richard Rising and mine superintendent Charles Forman. King's home was spared in the Great Fire of 1875, while these others burned to the ground. 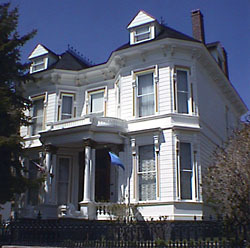 Judge Rising rented the King mansion in the 1880s (the King family returned to San Francisco), and in 1890 it was deeded to the Catholic Church. The Church leased the mansion to a series of renters, including silent screen actress Bobbette Simpson. In 1944, it was leased to Halvor and Virginia Smedesrude, who operated it as the Bonanza Inn, which served as an elegant retreat for eastern socialites waiting their six-week residency period for a Nevada divorce. In 1953, the property was sold to Versal McBride, owner of Virginia City's Bucket of Blood Saloon on C Street. The King--McBride Mansion is located at 26/28 Howard St. in Virginia City. Still in the McBride family, it is a private residence and is not open to the public.